Dr Shah, a medical dean, and his wife had been with their travel insurer for a number of years but following his major operation for bowel cancer, just before Christmas in 2009, they refused to renew his policy. They had all but given up hope of getting insurance when his wife found World First Travel Insurance on the internet. They simply keyed in their information and were quoted £135. The only other quote they had been able to get was for £800. With their insurance sorted they went ahead and booked a two week trip to the USA. Dr Shah's consultant confirmed he was fit to travel so he and his wife set off to the States for a trip they make annually in September. Unfortunately it was in the midst of airline strikes and their baggage got delayed. When their luggage caught up with them Dr Shah, 63, when lifting a particularly heavy case felt a twinge in his neck and thought he had strained a ligament. Mrs Shah expressed some concern that her husband looked unwell and seemed to be ageing day by day before her very eyes. Dr Shah said he felt well enough in himself and was unconcerned. However, a little while later, he had problems co-ordinating his right foot. He suspected a stroke (as his father had suffered with one) and said he would see how things went but meanwhile he would not drive. Two hours later he was unable to walk in a straight line. His wife insisted he saw a doctor straight away. His wife's insistence most certainly saved his life. Dr Shah was found to be suffering from a brain haemorrhage, with bleeding on both sides of his brain which had caused it to move within his skull. Dr Shah required surgery immediately, which was approved without delay as Mrs Shah provided the hospital administrators with full details of their travel insurance policy. Mrs Shah contacted World First Travel Insurance as soon as she could because of time zone differences. Dr Shah says, "The care and attention of World First's responded with was absolutely marvellous. It lifted so much of the stress and concern of the situation from my wife's shoulders. On World First's instruction their emergency rescue/medical partner Mayday Assistance sent specialist intensive care nurse, Mr Gary Wilson, to ensure I had all I needed in terms of my treatment and recovery. Gary stayed with us until we were safely home. When I was well enough my wife and I were flown home in business class with Gary alongside. Dr Shah adds, "I cannot speak highly enough of World First Travel Insurance and Mayday Assistance. I implore everyone I come across, both personally and professionally, needing travel insurance to use World First. People are astounded when I tell them what they did for me in my own life or death situation. I am so indebted to them." After this very traumatic experience World First is delighted that Dr Shah has returned to good health. 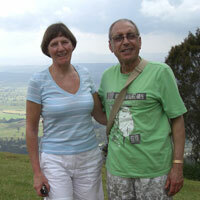 He and Mrs Shah recently returned from a month in Australia, visiting their son, a pharmacist in Queensland. Dr Shah says, “My wife insisted we took a holiday to visit our new grandchild, born in February, as my health ruined our last break. We had an absolutely wonderful time, always with the peace of mind that we were covered by World First Travel Insurance."